Climbing Kilimanjaro is an unforgettable experience and an opportunity to climb the world’s tallest free-standing mountain. Once you have chosen which route to climb, you will want to know more information about Kilimanjaro and what to expect from the trek. The important factors to consider such as; what is the best month for climbing Kilimanjaro, what are the temperatures on the mountain, what are the trail conditions like, how far will I walk and how do I cope with altitude sickness? The answers to these questions and many more can be found here the following pages of my website and in this section I will cover the following topics, to jump ahead click on any section category. 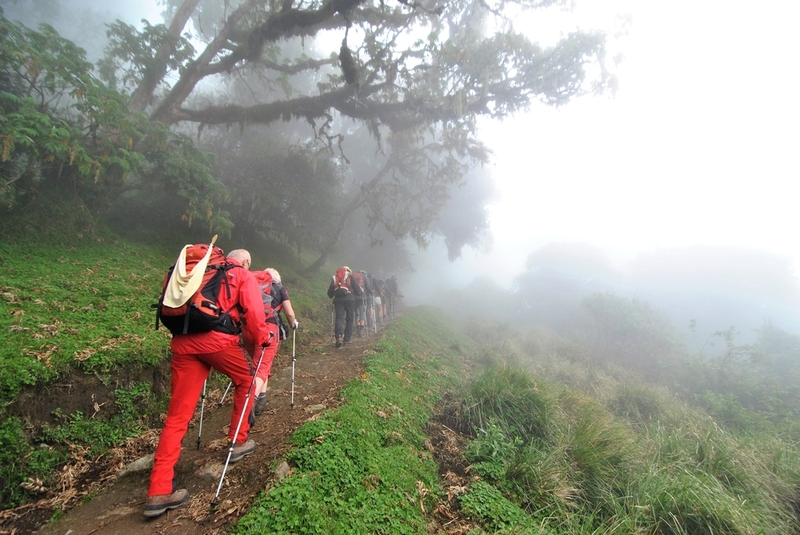 There are two wet seasons a year on Kilimanjaro that you will want to avoid. The trail conditions in the rain-forest can deteriorate quickly with heavy rainfall making the paths difficult to negotiate; you may have to start your trek further down the mountain if the tracks for the vehicles become impossible to drive on. Temperatures in the various climate zones on the mountain remain fairly constant all year round; however the range in temperatures between the rainforest and the arctic summit zone is vast and can differ by up to 50 degrees. You will trek through five ecological zones during your Kilimanjaro climb and you should be prepared for any weather condition imaginable. With good planning, proper clothes and equipment, this should not be of concern. No matter which route you decide to climb Mount Kilimanjaro, your daily routine will basically be the same. 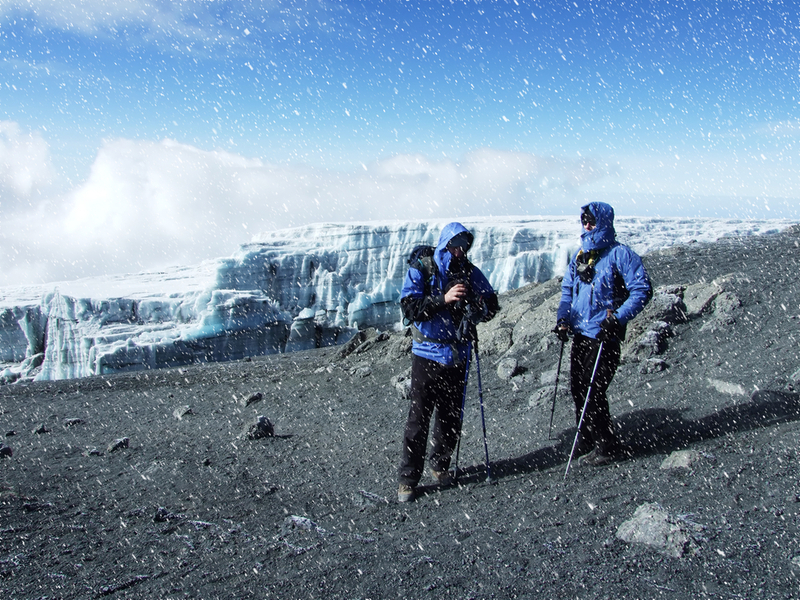 It is a requirement to have a licensed guide and staff with you on Kilimanjaro. The crew consists of a team of individuals with different tasks. Most Kilimanjaro guides are professionals who have climbed and summited countless times. They are very experienced, having dealt with a breadth of issues while on the tour. Guilds are required to be licensed by Kilimanjaro National Park, where they must complete extensive training. They are required to learn about the history of the mountain, the geography, the effects of altitude, and how to handle all emergencies. Most guides are fluent in English and are very personable. Kilimanjaro Porters Assistance Project (KPAP) aims to improve the working conditions of porters on Mount Kilimanjaro and other hiking areas in Tanzania and was founded in 2004. Porters must me appropriately dressed for the trek with warm and waterproof clothing. Porters must be adequately fed on the trip. The load carried per porter must be limited to 20 kgs. There must be adequate porter to client ratios; 2 porters per client on the Marangu Route, 3 porters per client on the on Rongai, Machame, Shira, Umbwe routes, 3 – 4 on the Lemosho Route. Porters, guides and cooks must be provided with a set wage. Clients should be advised to tip staff appropriately for their services at the end of the trek. Once on the Mountain, your guide is your mentor and it is his duty to advise, lead, support and encourage you to safely achieve your personal goal, then to bring you down to the gate again. He will hike with you and answer any questions you have about the mountain. It is important that you work closely with your guide and follow his advice. If you feel unwell at any time you must be honest and tell your guide. The guide recruits the mountain crew (porters, assistants, chefs) and it is his responsibility to see that the crew work efficiently and everything runs smoothly and safely. Your guide is responsible for managing many duties, as well as your safety. 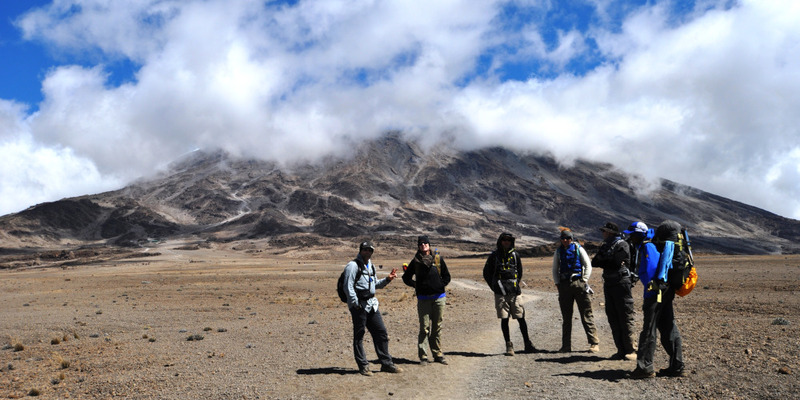 One of the most important factors when climbing Kilimanjaro is your Guides and Porters. It will be their knowledge, assistance and support that will get you safely to the summit and down again! The porter to client ratio is generally a calculation of 2.5 porters to 1 client. The maximum load a porter should carry is 15 kg. Porters carry client’s back-packs, food, trekking equipment and general supplies as well as their own personal gear. Their load is weighed at the entry gate. More porters may need to be allocated to the climb crew if loads exceed National Park regulations. Porters have a tough job. They carry the climbing equipment between campsites and set up everything so it is ready when your team arrives. Not only do they carry the shared equipment, like tents, chairs, tables, lanterns, stove, gas and water, but they also carry the personal items of the clients. Their load is limited to 20 kgs by the park service. Your team will also include a highly skilled mountain chef who is responsible for knowing any dietary restrictions of each climber and adjusting meals accordingly. Nearly all meals on the mountain are prepared fresh- except for the occasional bagged lunch. Preparing and cooking food at altitude (often in bad weather conditions) takes skill and patience, these guys are superstars! Altogether, this team of individuals will make your climb as comfortable as possible. Though they make a decent living by Tanzanian standards, they are on the mountain many days out of the year and have a physically demanding job. They depend on tips, and climbers should budget a substantial tip for their climbing crew. 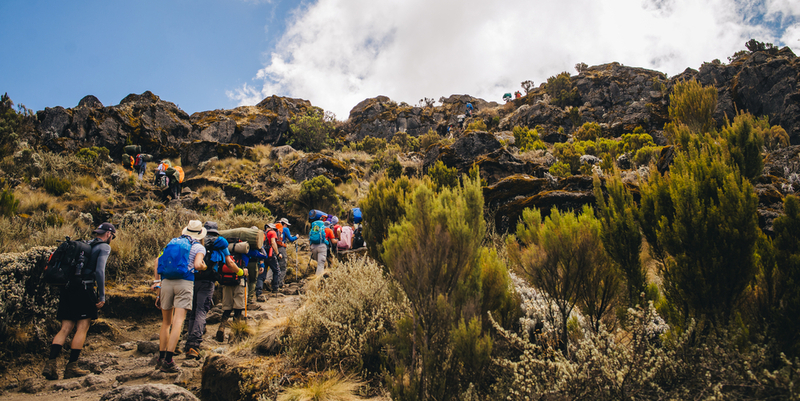 A general estimate, for your budget, per Kilimanjaro climber is roughly $175 to $250 per person depending upon the following factors: the number of people in your group, the number of the porters (which is often quite large), number of guides, cooks, and sometimes the route. It is impossible to predict an exact tip in advance because it really depends upon how much gear and weight is carried up the mountain. There is not a de facto standard of tipping for all companies, it’s only a recommendation from organizations, NGOs and the Tanzanian government. The menu on Kilimanjaro is designed to ensure your food intake matches your level of exertion. It will provide you with a good balance of protein, carbohydrates, fruit and vegetables. When you are at altitude you could start to feel nauseous and your appetite may be suppressed, so the meals prepared at high altitude usually contain more carbohydrates and less protein to help you digest faster. Breakfast – ‘Bed tea’ (with a smile), chapatti, oat porridge, sausages, scrambled eggs, French toast with honey, toasted bacon and cheese sandwich, fresh fruits or fruit filled pancakes. Lunch boxes may contain – samosa, sandwich, fresh fruit, boiled egg, chopped salad vegetables (carrot, tomato, pepper), cashew nuts, chocolate bar, cake and fruit juice. A hot drink will be prepared at the stopping place. Energy snacks may be provided for the summit e.g. chocolate, nuts, popcorn or biscuits. Desert may be – Fresh fruits, fried bananas with chocolate sauce, Tanzanian pancake with honey and yogurt. Hot drinks with each meal include (tea, coffee, milo, chocolate). You may wish to bring your own snacks to provide well deserved treat, or energy boost! Chocolate is generally the best answer and if it has nuts, even better. Whatever you choose though make sure it is a favorite treat and not a ‘power bar’, or ‘energy gel’. If you are suffering from altitude sickness your appetite may be suppressed and these snacks may become a good supplement to your meals, so make sure it is something that you enjoy eating! A powdered energy drink such as Gatorade sport is also a good source of energy and will help with the taste of the water if you have been using iodine tablets. You will need to consume more water on Kilimanjaro than you would normally drink on an average day at home to keep properly hydrated. This is due to the physically exertion of walking between 4 – 8 hours per day and the effect of being at high altitude. Remember to drink at least 4 liters of water ever day when above 12,000 feet. 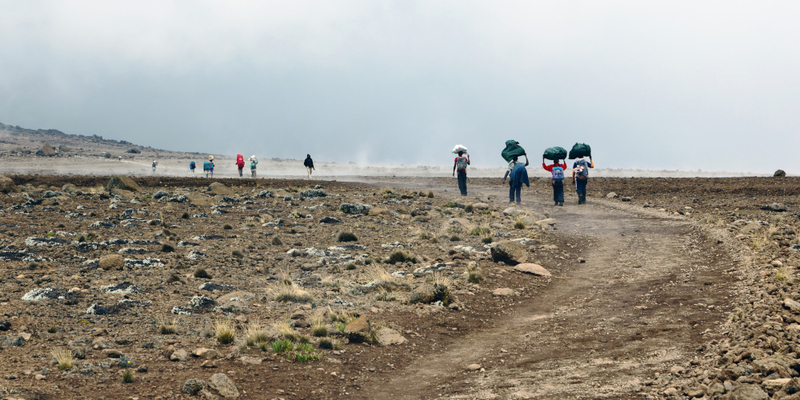 Water is provided by the porters who will fetch water from the streams near the camps on Kilimanjaro. The water is then boiled by the porters, which should be fine for drinking. However you may wish to bring additional water treatment methods such as; water filters or Iodine tablets if you have a particularly sensitive stomach. High on Kilimanjaro the water is extremely clean, except for those few places where it has been contaminated by human waste. The lower you are, elevation-wise, and the closer you are to campsites and popular trekking routes, the more likely it is not clean. Wherever you are, it’s a good idea to boil or treat your water at all times. Water is readily available at most camps and huts. At worst, such as Barafu Huts on Kilimanjaro, it’s a half hour’s easy hiking away. Hut reservations are only required for the Marangu Route. The huts on the other routes (Mweka, Umbwe, Machame, Shira Plateau) are merely burned-out metal shells often filled with trash. Most non-Tanzanians who use these other routes bring a tent, and the huts are used only by the guides and porters, who do not seem to mind their state of disrepair. If you do decide to use the huts on these other routes, it is a matter of first come, first serve. Marangu route is the only route with dormitory style mountain huts to sleep in at night. There are 60 bunk beds each at Mandara and Kibo Huts, and 120 bunk beds at Horombo Hut. There are communal dining areas and basic toilet and washing facilities. Rongai route climbers who join Marangu route for the summit attempt and for descent do not have access to the huts for sleeping, this is KINAPA policy. If you do not have a tent and really must stay in huts as you ascend the mountain, the ones on the Marangu Route are in good condition. 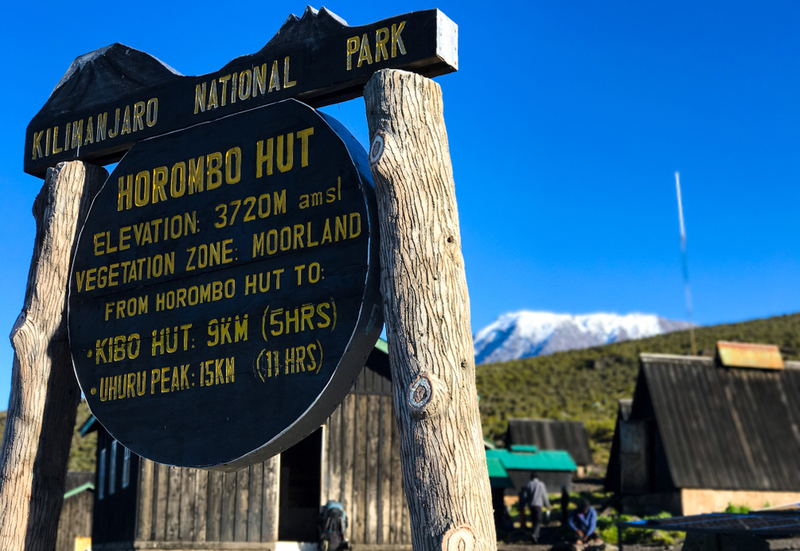 There are three main huts (Mandara Hut, Horombo Hut, and Kibo Hut), spaced a day’s walk apart. However, each of these huts are surrounded by a virtual village of buildings, and the names refer to the old huts that existed long before the other structures were built. Some of the additional buildings are for porters and guides to sleep in; others are for park officials and small shops. Tourists generally sleep in the original huts. Reservations must be made at the park offices at the Marangu Gate. Your outfitter will arrange these reservations for you as part of your climb. When you arrive at each hut complex on the Marangu Route, you or your guide must go straight to the caretaker’s office and show your reservations to park officials, who will help you find your hut and sleeping quarters. As with most other things, your guide will take care of this for you. There are no facilities in the huts except for bunks; you need to bring a sleeping bag and sleeping pad. Cooking must be done outside. At both Horombo and Mandara Huts, there are separate facilities for washing—small bathroom buildings, with cold showers and toilets. The toilets at Kibo Hut are like toilets on other routes on the mountain—big earthen pits. There is no natural water supply at Kibo Hut, so there are no showers. All other routes are camping only with long drop toilets and water that is carried and delivered by porters. The campsite areas make the most of the available terrain, with some having precarious ‘drops’ for the unsuspecting hiker. It is advisable that you familiarize yourself with the location of toilets before dusk. Water is provided for personal washing but remember to use sparingly and keep in mind that there is no place ANYWHERE on any route to dump garbage. All trash is carried back down the mountain to the gate by the porters – this is a large volume of garbage for each group so be mindful of what you are “throwing” away. Each climber should carry a small plastic bag to collect personal garbage and give it to the porters at the end of each day.